This picture shows four men posing for a picture. The man on the left is the local policeman for whom we have no name. Second on the left is Mr Marks, the harbour master. Third from the left is the Ex Provost, Mr Reed. Judging by his uniform, the final man is probably the coastguard or perhaps the Lighthouse keeper. Notice the policeman is wearing Breaches which was standard at the time. Mr Wilson Marks was a Customs and Exise officer. 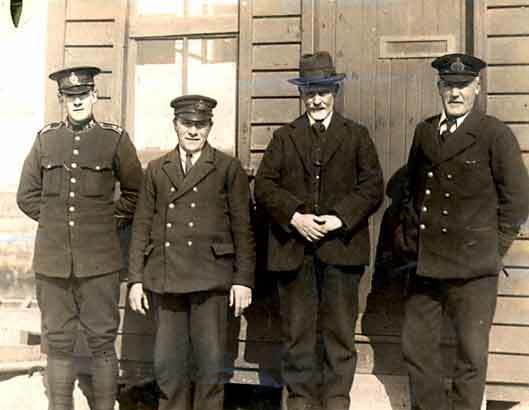 I think the policeman could well have been Sergeant Donald Hume, who was stationed at Cromarty from 1912 (when promoted Sgt) until 1928 when he was moved to Invergordon. Seems as though he received a lot of young recruits for brief periods of training/relief duty over his time in Cromarty, but he was the 'main man' for the area. Although chevrons are conspicious by their absence, the presence of gold braid around the collar and epaulettes (and the hint of brading on the cuffs) does suggest a higher rank than Constable. Sgt Hume was commended by both HM Govt and the Royal Navy for "rendering valuable service" during the war. Incidentally, his opposite number at Invergordon, Sgt John Campbell was awarded the King's Police Medal (KPM) (such award being almost unheard of for such a low rank, except in cases of Extreme Gallantry) for his similarly "rendering valuable service" to Govt and to RN. Sgt Hume (native of Caithness, and who served 4 years up there before transferring to Ross & Cromarty Force in 1902) did receive the King George V Silver Jubilee Medal in 1935 for "Long Service combined with good character and merit during the reign of HM King George V" - nice but not in the same league as a KPM. If anyone has any photographs or information pertaining to police officers in Highlands (especially Cromarty-shire and Ross & Cromarty, but also Inverness, Nairn, Caithness, Sutherland), I would be glad to hear from them.